Hasbro first released the Leia Organa as Jabba’s Prisoner during the last few waves of The Legacy Collection, but the very same mold has been used a couple of times since then, although given Hasbro’s spotty distribution, chances are you may have seen only one of those releases or none at all. The joints work well, but there is one small nit to pick. Leia’s long, thick tress can be a little restrictive for the neck movement on it’s own, but in addition to the accessories, it downright kills the usefulness of the joint. And speaking of accessories, Leia comes with a good number of them. The only repeated one is the force pike, only this time it has some silver paint deco on the tip. The sandtorm garments are what make this figure unique, starting with a pair of clip-on goggles made of transparent plastic with the rims painted white. 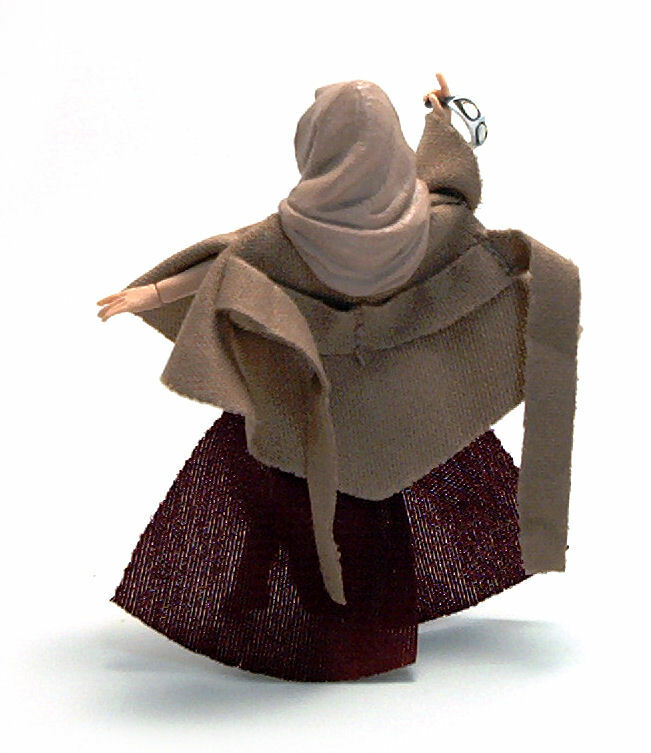 The outer garments consist of a fabric poncho with a pair of straps at the back and a rubber shawl that goes over the head. 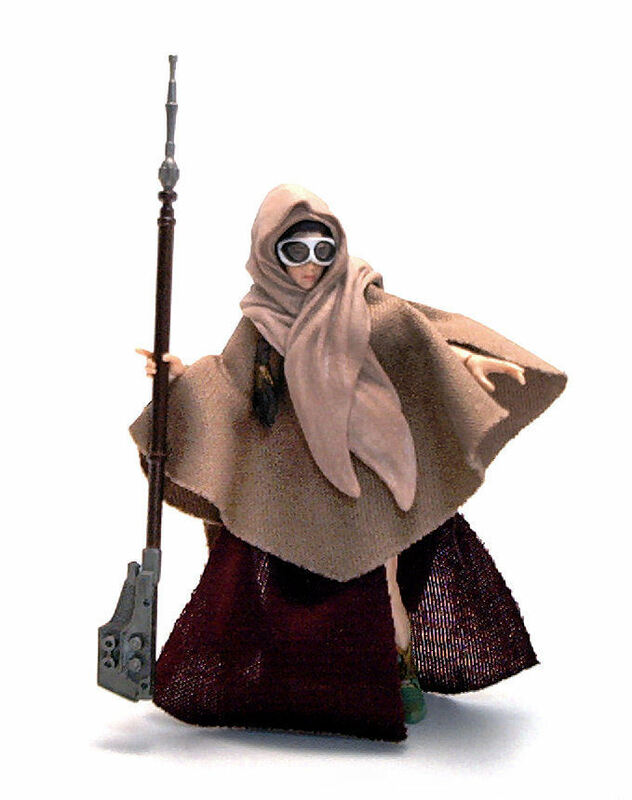 The accessories are a little tricky to put in place, requiring you to take off the head and slip it inside the shawl, place the goggles and then slid all back onto the neck post. 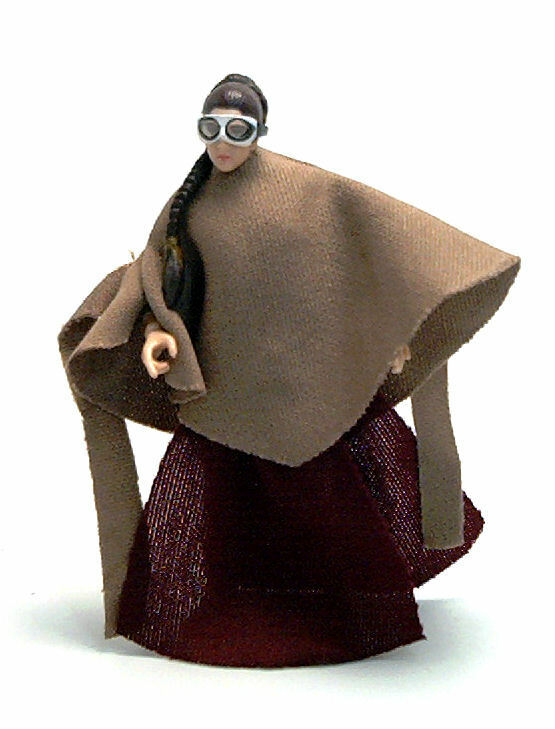 As I mentioned, the rubber shawl pretty much negates the usefulness of the neck joint, but the torso articulation kind of picks up the slack for making Leia look to the side. The one aspect I didn’t particularly care for was the color scheme. Oh, the paint applications are all neat and precise, but all colors seem to be a tone lighter than they were for the Legacy release. 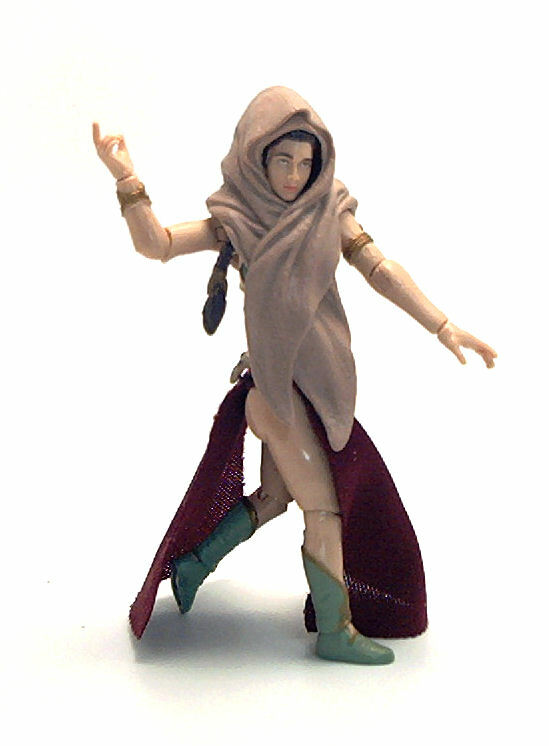 The flesh colored plastic is paler, and the boots and bra are painted in a moss gray hue. On the face the pupils look smaller and the lips are barely darker than the rest of the face. Even though both figures have the exact same head, both Leias look so different side by side, that it is like watching cosplayers wearing the same costume at a Con. Although, I have to admit that the Sandstorm Leia has a rather eerie resemblance to Debbie Reynolds (actress Carrie Fisher’s mom). Everything said, this is one figure I would have probably passed on If I had to choose between her and some of her wave companions. Based on the way she was packaged but with all the accessories on her, this deleted scenes Leia looks interesting enough to have in my collection. In your Slave Leia review you complain about her dark red lips. Then on this review you complain about the light toned lips. (which are more accurate by the way. as are the lighter skin tone and bikini color. )I think you may just be too hard to please. I don’t think you noticed, but both of those reviews were written by different people. Errex reviewed this one, and I reviewed the other.